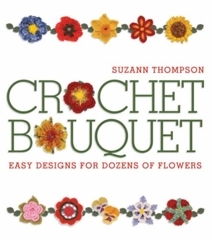 As many times as I’ve searched for crocheted flowers on the Internet, I would have welcomed a book just for flowers and now, there are a few available. One of these is Crochet Bouquet by Suzann Thompson. I’d been eyeing this book at my local book store and was pleased when I found that Suzann was sending me a copy to review. Crochet Bouquet provides almost 50 designs for flowers ranging from the whimsical to abstract to more realistic. The flowers can be made from any yarn, whether it’s fun fur, thread, acrylic, wool, or alpaca. Examples of the flowers are well photographed, show good details, and provide several versions of the flowers in different yarns. Also provided are examples of using the flowers on jeans, scarves, blankets, pillows, hats, bags, curtains, and cards. Of course, you’re not limited to these types of projects – imagine a girl’s headband with poppies or pansies, a rose pin attached to waist of a spring dress, or a tiny thread crochet pom pom hanging from a cell phone cord. Check out the book page at Ravelry to see examples of the flowers or join the “crochet bouquet along” group there along with over 200 members crocheting flowers.